Looking to buy a robot or drone, but don’t have the proper funds? SolveLight Robotics have teamed up with Unisource Capital to give you the chance to finance your robotic purchases! You no longer have to wait and save up enough money to buy a robot, quadcopter, or 3D printer in full from us now that you can easily finance your order with only a few simple steps! 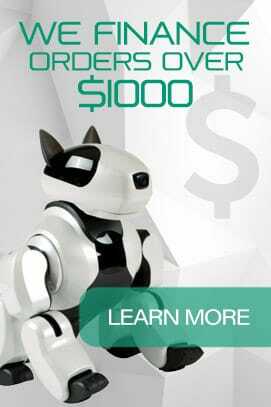 Finance a robot today and only pay monthly installments, instead of paying the whole sum right away. We understand not everyone has $1000 lying around the house so take advantage of this great opportunity now! This is a great opportunity for businesses to receive the latest technologies out on the market, without the stress of greatly reducing their budget. What’s even better is that financing allows you to acquire the necessary tools for your business to succeed all the while making money! Recently a Japanese restaurant owner invested $150,000 into robotic manipulators for his restaurant. These robots can produce ramen soup every minute and half, which produces 320 bowls of ramen in one work day and at the cost of $10 per bowl the restaurant owner makes up to $3,200 a day. In 2 months the owner will have already payed back the entire loan and by the end of the year his business will have pulled in over $1,000,000. As an added bonus the robots don’t take sick days or breaks, they only require maintenance. An excellent example of how you and your business can benefit from financing robotics. Schools and universities looking to purchase robotics will be able to afford the latest equipment for students and teachers to use. The experience that students receive working with the latest technologies will open opportunities for them to start their own business or land in demand jobs in their field that pays great! Schools and universities that have a high rate of students finding jobs after graduation brings the institution recognition, which in turn increases the number of students applying to get in; increasing the schools or universities revenue. What’s even more interesting is that robotics has already started to become incorporated into schools and universities all over the country. No better time to invest into roboticsthen now. The finance process works by filling out the finance application found on SolveLight Robotics website(COMING SOON!) then once the application is filled out we send it off to Unisource Capital for review, where they will go over your application and apply an interest rate based off your credit score. The minimum finance amount is $1000 or more. All finances are final sales and are not refundable. SolveLight Robotics is a safe, secure, and well-trusted site that is protected by the best encryption software out today so all delicate and personal information is guarded from hacking and security breaches. To insure that all our customers have a pleasant shopping experience we spare no expense to insure their security. Contact SolveLight Robotics today and a SolveLight’s representative will assist you with any questions you may have.